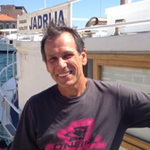 Damir is in fact a renowned windsurfer who competed internationally as well as a merchant seaman who skippered boats throughout the globe before settling down in Sibenik and being the skipper on our Croatia Dalmatian Coast trip. He is a very experienced local skipper and he and his boat “Luce” have probably been down the Sibenik Channel more times than anybody. Damir has been skippering for SwimTrek in Croatia since 2004.